Hey, are you tired of the whole countdown of the best/worst of 2013 thing yet? Ok, GOOD, because here's another one. 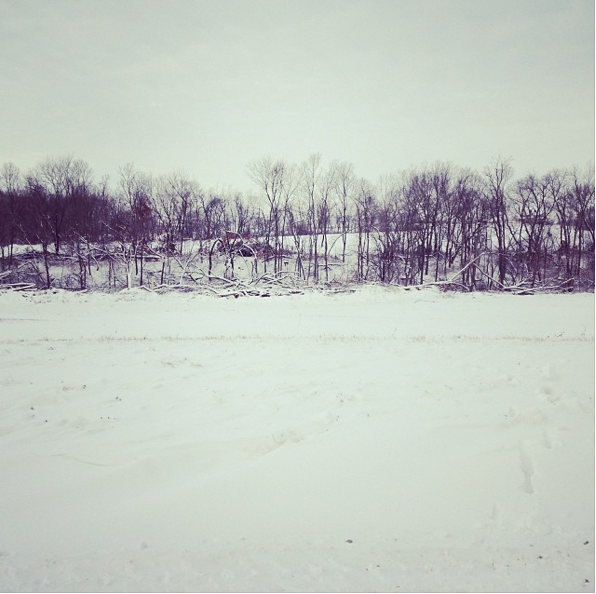 2013 was a big year for me because it was the year I started this blog! 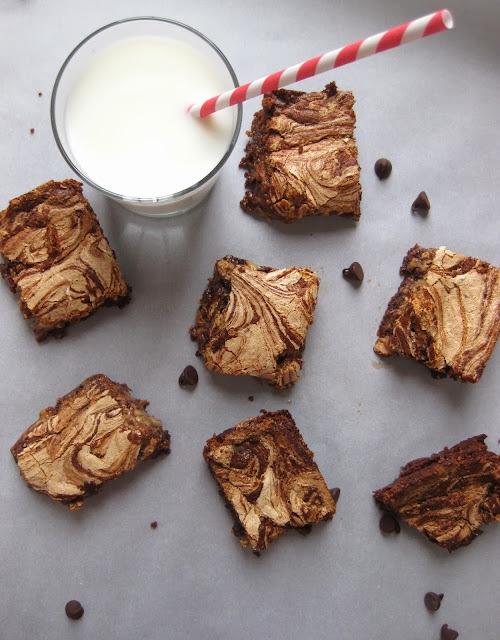 I'll have more reflecting on that and my personal recipe favorites later in the month on the blogiversary, but for now, here are the 12 most popular recipes of 2013, as established by your pins, shares, and page views. 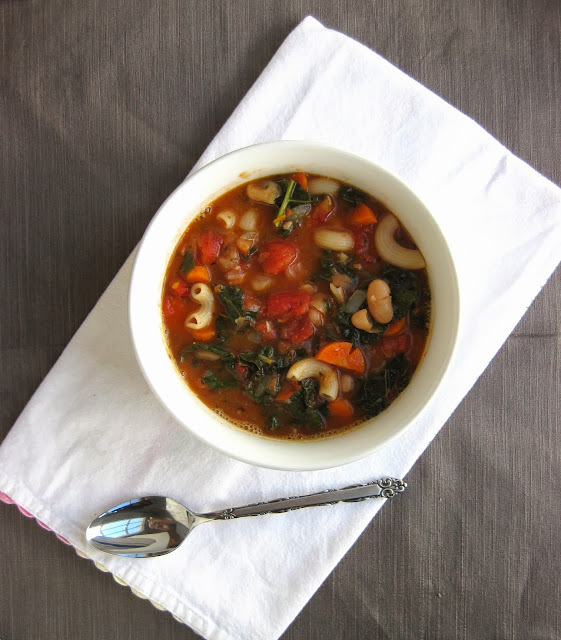 This hearty healthy soup is comfort food in a bowl. 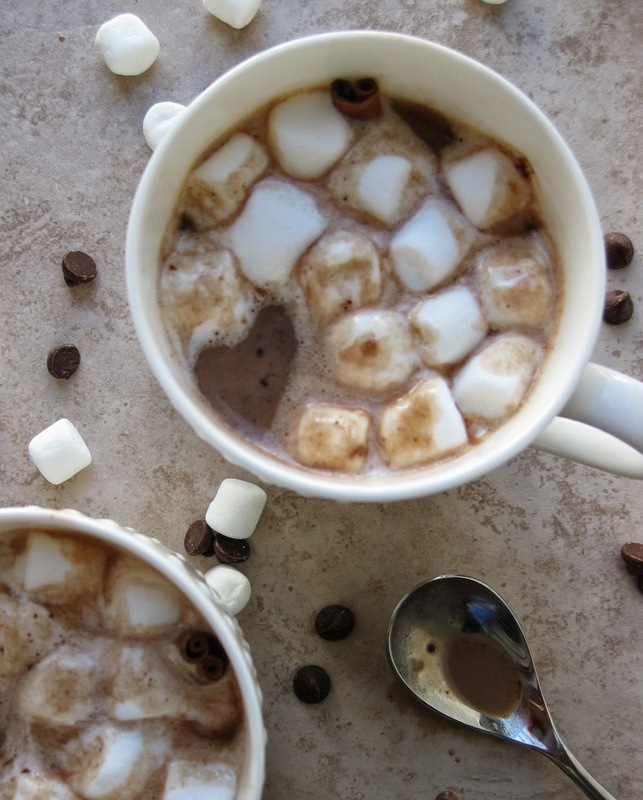 Chocolate, peanut butter & marshmallow? Done and done. Hi friends. I hope you've had a lovely Christmas. I'm still in Missouri, where I've been hanging out with the cutest grandpa in the world, eating too many cookies, snuggling with my hubby, and playing in the snow. I love it, although I must admit I'm kind of a wuss when it comes to windchill temperatures in the negative twenties. This southern girl is just not cut out for that kind of cold. These few days between Christmas and New Year's are sort of strange, aren't they? There's the anticipation for the new year and the promise it brings. Some to-do lists and resolutions for things we'll do better. or differently. Hey, I made you some cookies! 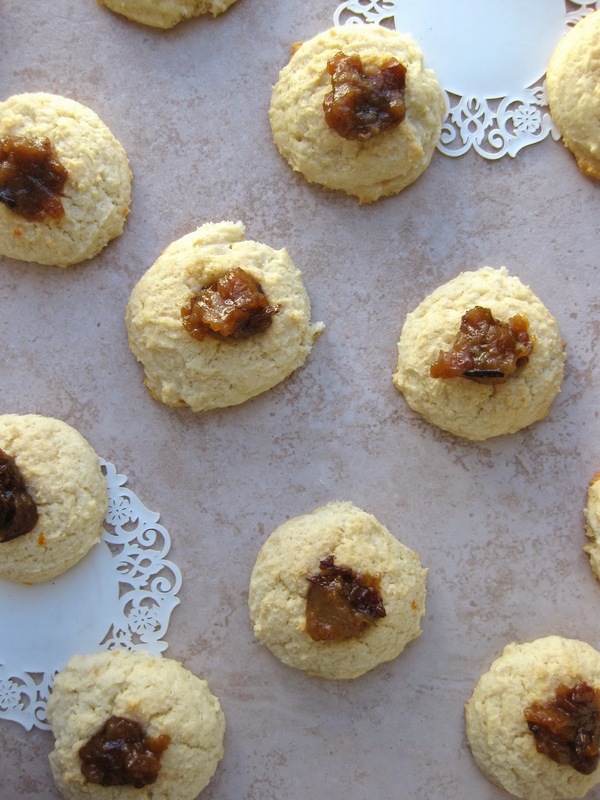 Soft, sweet crumbly cookies with a surprise ingredient. Well, not so surprising since you probably already read the title. GOAT CHEESE! Yes, I put goat cheese in your cookies. But I promise they're so good. 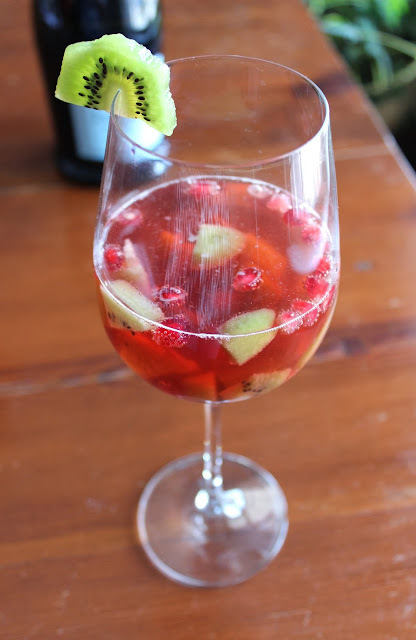 I don't know about you, but I need a large glass of wine. annnnd some party appetizers. Preferably something in small pieces so I can justify the large number of them that I am about to consume in post-exam induced celebratory eating. And maybe some vegetables and fruit so I can still get my nutrients? But also bacon. And cheese. Definitely cheese. The idea of whipped goat cheese came to me, like a vision, in a moment of studying procrastination. I don't even remember what I was supposed to be studying, but I was dreaming about an appetizer I could make to bring to a holiday party the day after my last exam. Once I had the idea of whipped goat cheese on my brain, I literally could not stop thinking about it. 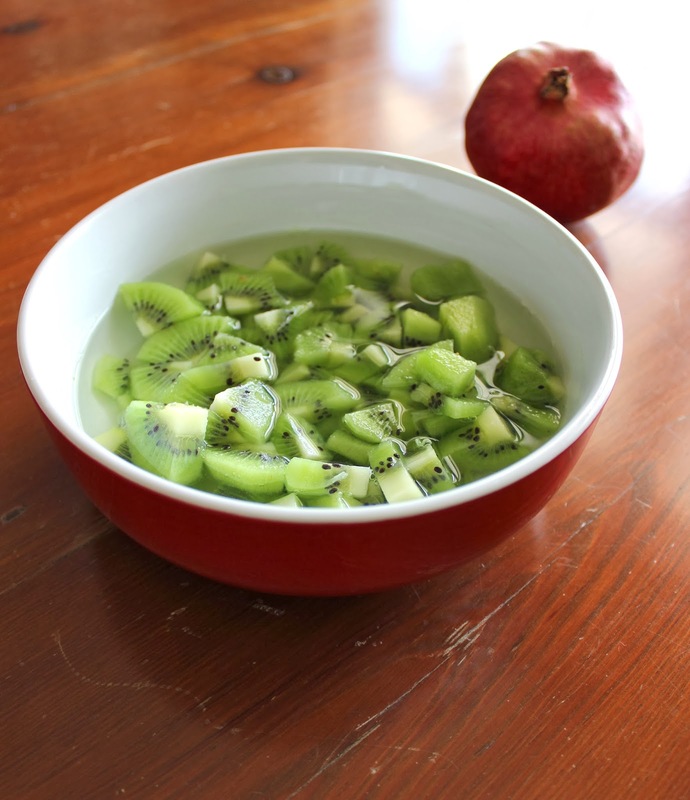 On the night before my second exam, I was laying awake in bed dreaming of flavor combinations, asking Adam for ideas. He told me go to sleep. I was so tired and brain-dead by my next exam, I'm lucky I didn't start writing out recipe directions. I have a feeling that would not have gone over well with my professor. I have to admit that my weird studying-crazed brain came up with some pretty good flavor combinations. 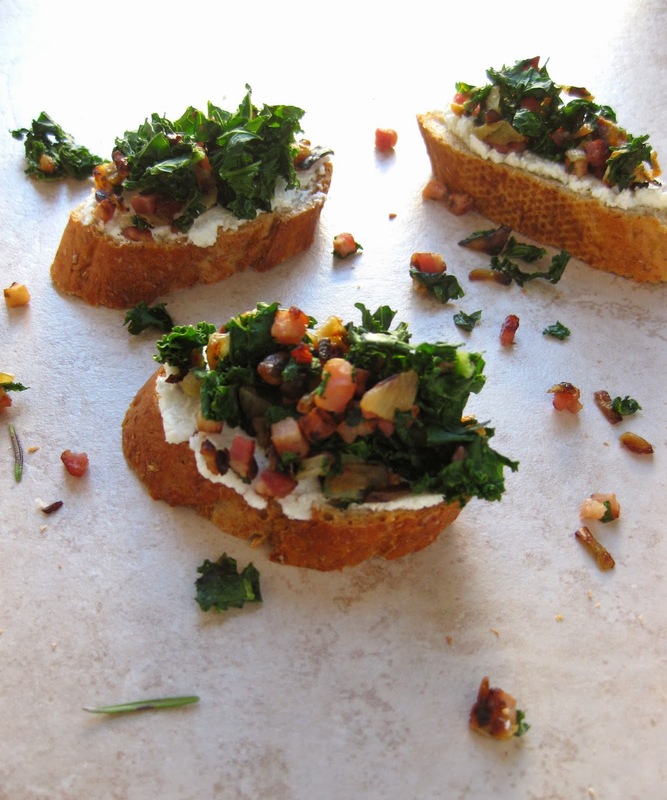 In fact, I'm as obsessed with the toppings as I was with the idea of the whipped goat cheese. 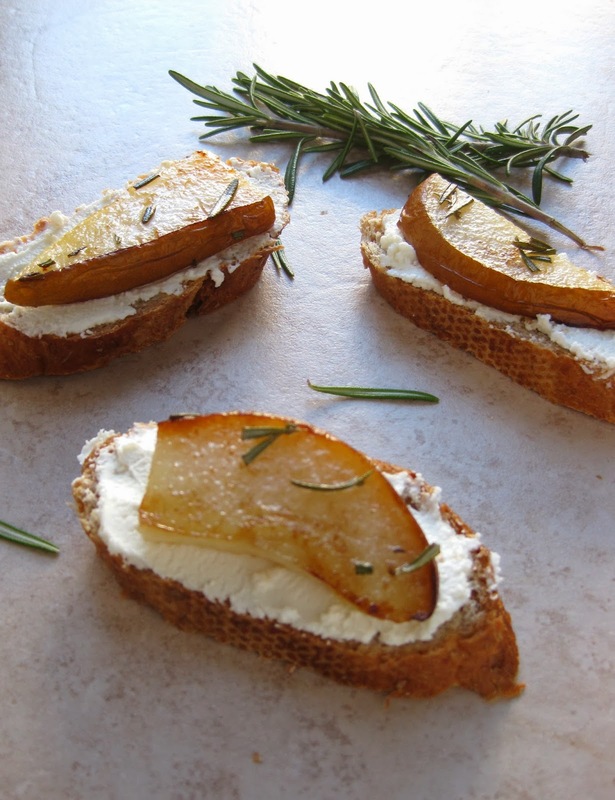 I knew I wanted a sweet and savory variation, and after my professed love of these rosemary roasted pears, I already knew what the sweet crostini would be. I used bosc pears, which held up to roasting beautifully, thanks to their firm texture, and their sweetness paired perfectly with the creamy the goat cheese. When asked what he would like to eat on whipped goat cheese crostini, his response was "bacon." When coaxed further, (What about a vegetable?) his response was "spinach." I opted to use kale instead, because I thought its heartier texture would hold its own with the other ingredients. I also added in some caramelized onions and garlic and used pancetta instead of regular bacon. These were, I think, the party favorite. I personally love them both together, mostly because I have one of those weird palates where immediately after eating something savory, I want something sweet, and vice versa. I could go on eating these for a LONG time. 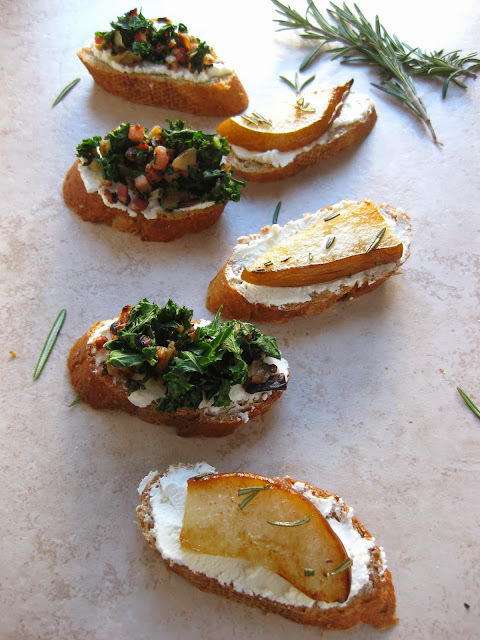 All things considered, these crostini are pretty easy to make. The whipped goat cheese is simply room temperature goat cheese mixed with half and half, honey, and any other spices you like. While the pears were roasting, I made the pancetta/kale/onion mixture and then all of it was ready around the same time. I put everything into containers, and assembled the crostini at my friend's house for the party. 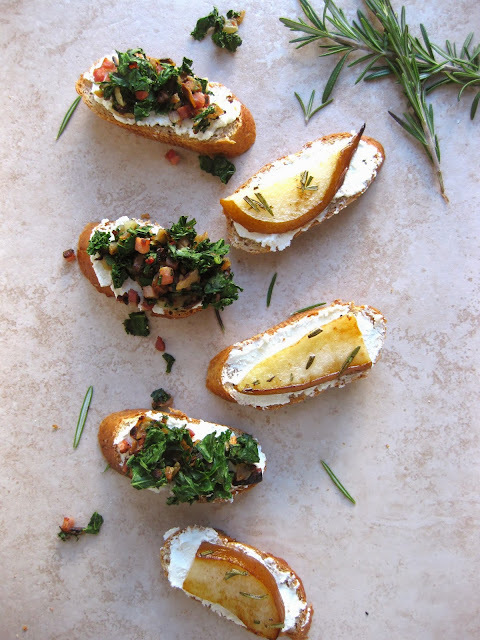 Also, I know goat cheese is an ingredient that people seem to either love or hate, so if you think these look good sans the goat cheese, try them with whipped feta instead. *This quantity makes a LOT. If you're making appetizers for less than 12 people, I would halve the the whipped goat cheese recipe. 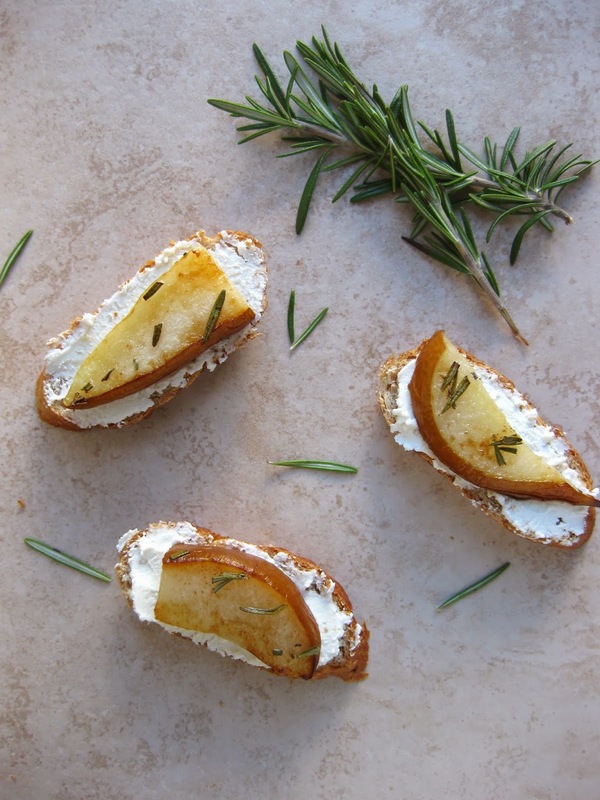 Assemble sliced pears on a cookie sheet. Drizzle with olive oil and sprinkle with rosemary. Bake for about 6 minutes, then remove and flip slices over. Bake for an additional 6 minutes, or until both sides are golden. Heat olive oil in a large skillet over medium-low heat. Add onions and cook for 10-15 minutes, or until golden and translucent. Add the garlic, red pepper flakes, and pancetta, and cook until pancetta is browned and has rendered all its fat. Remove onion and pancetta mixture onto a plate lined with paper towels to remove excess fat. Return to pan and add kale. Cook for only a minute or so until kale is soft. In a medium bowl, combine goat cheese, half and half, and honey. Add a pinch of salt and pepper and any other fresh herbs you like! If desired, brush slices of baguette with olive oil and roast in the oven at 450 for 5 minutes. 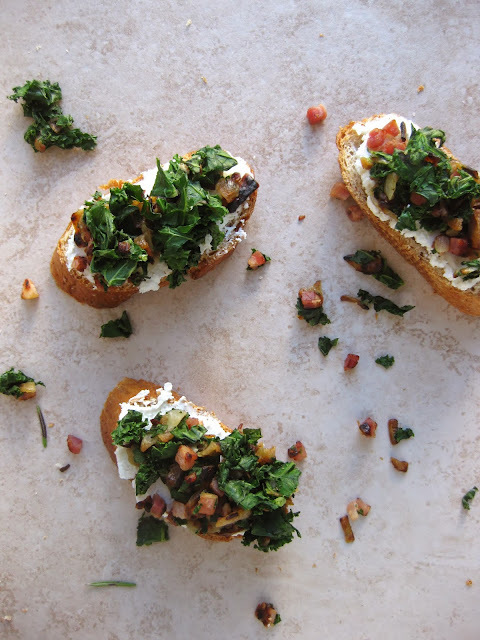 Spread each slice with the whipped goat cheese and top with pears and pancetta/kale mixture. Whipped Goat Cheese inspired by Giada De Laurentiis. Hey friends--I'm crawling out from the rock I've been living under the past week while studying for exams to share a guest post from my dear friend Erin. I've sung her praises once already, but I'll have to do it again. She oh so generously agreed to post for me during exams MONTHS ago, and I'm so thankful for her unwavering support. She's been gluten-free for over 4 years, and has become quite the gluten-free baking expert. I can't wait to make this pie! Traditions are a huge part of the holidays for me. There are certain components of seasonal foods that CANNOT may have to be change. Pumpkin pie is one of those desserts for me. When I went gluten-free I assumed holidays would never be the same since I no longer would have my beloved traditional pumpkin pie. 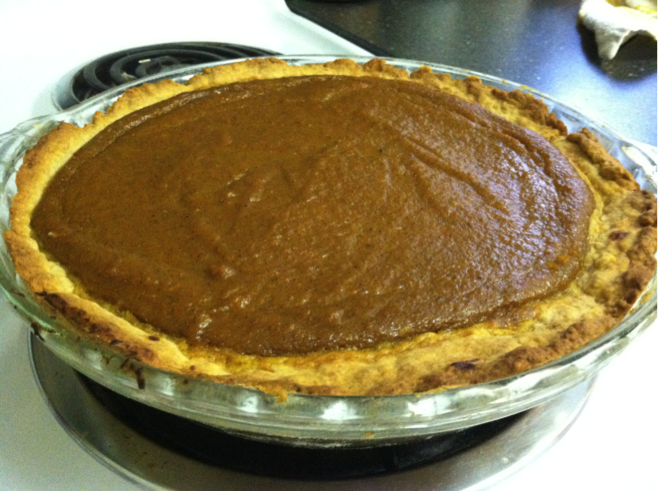 Over the years, I have experimented with crust-less pumpkin pies, pumpkin mouse, pumpkin pudding and other substitutes for my pie. These substitutes all left me disappointed and motivated to find an option that would keep my holidays as traditional as possible. I have finally come up with a crust recipe that will not disappoint. My family members and friends that have tasted it are often surprised when I tell them that the crust is gluten free. Try making this pie over the holidays to taste how I changed updated my holiday traditions. Lightly grease a pie pan. Cut cold butter into pieces. In a large bowl, combine flours and butter. Slowly add in additional crust ingredients. The water should be added one tablespoon at a time until you can form a ball of dough that is slightly moist but not “wet”. Roll the dough ball out into the pie pan to cover the bottom and sides of the pan. 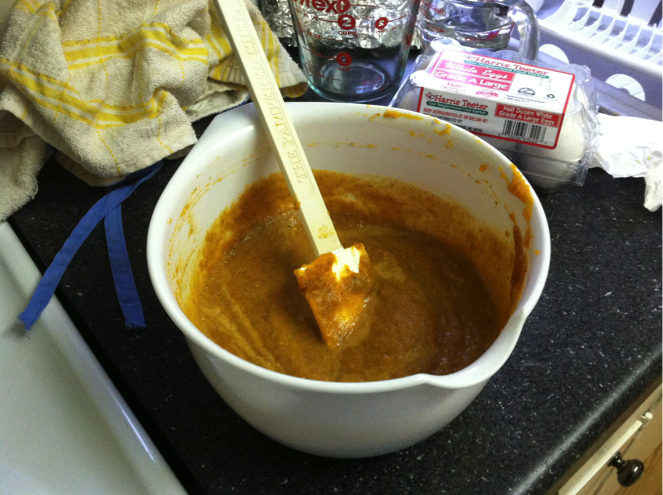 In a large bowl, mix the pumpkin, sugars and spices until well incorporated. Add the egg and the milk slowly to combine. Pour the filling mixture into the crust. 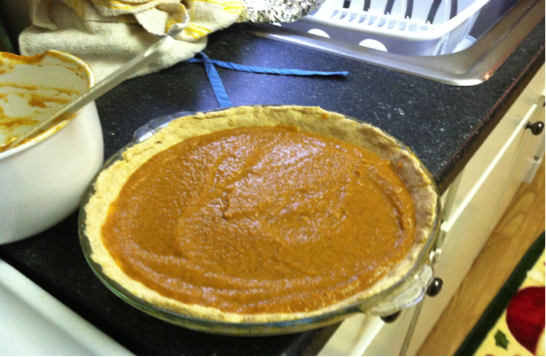 Bake for about 30 minutes or until filling is firm and top of the pie is a rust/ brown color. If you see that the rim of the crust is burning toward the last 10 minutes, cover the burnt parts only with aluminum foil to keep them from burning further. One of my favorite Saturdays in recent memory was back in September when Adam and I went hiking with my sister and her boyfriend at Occoneechee Mountain in Hillsborough. It wasn't a particularly long or strenuous hiking trail, but it was wooded and pretty and cool, and at the summit we stood and felt accomplished. Afterwards, we walked through a historic neighborhood to find a local barbecue place for lunch and then meandered around downtown. We stumbled into a carefully curated book store and wandered some more until we found Matthew's Chocolates, a teeny chocolate store and cafe with unique truffles and candies, enormous homemade marshmallows, and the most delicious Mexican hot chocolate I have ever had. The weather had just enough chill in the air to justify hot chocolate, and Adam and I decided to split one. Ordinarily, I like my spicy separate from my sweet, so I was hesitant about ordering the Mexican variety, but my sister insisted. After one sip, I regretted having to share it. The spice was subtle but brought out the depth of the chocolate flavor. Each sip was sweet, yet slightly exotic, and immensely comforting. It instantly became a powerful food memory for me, most likely because of the invigorating morning hike, the charm of the downtown, and the fact that I was with some of my favorite people. 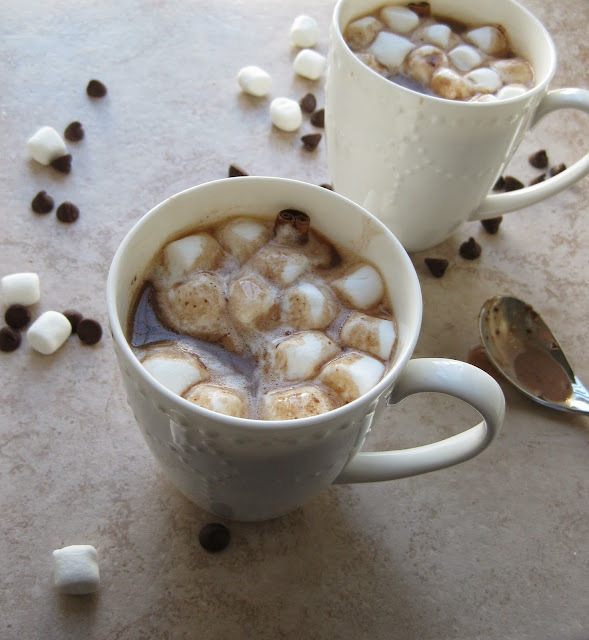 I've done my best to recreate that hot chocolate for you here. I chose to use a crock pot because I wanted the spices to have some time to meld with the milk and chocolate, although you could make this more quickly on the stove top if you like. Just be sure to keep the heat on low so as not to burn the chocolate. I'm hoping sipping on this will bring me some comfort on long nights of studying this week. Finals are here, and I'm sure you don't need me to tell you how stressed I am. BUT, I'm also excited because a dear friend is doing a guest post next week. 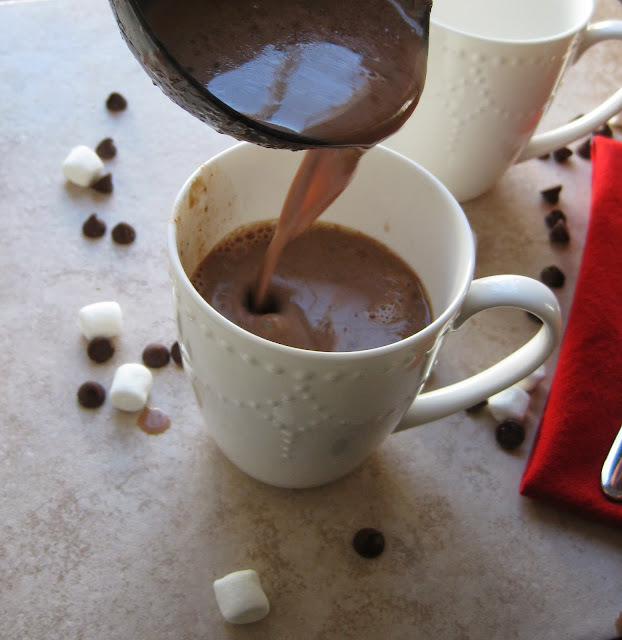 For those of you lucky enough to not be studying, this hot chocolate would be lovely to serve at a holiday party or just to sip on while decorating, wrapping, or other festive things. Extra can be stored in the fridge and reheated in the microwave. Inspired by Better Homes & Gardens and Gimme Some Oven.